Tasty filling lunches served daily at Cherry Leaf. Ciabattas, Focaccia and wraps filled every morning with fresh local ingredients and beautiful salads made to order. Available to eat in or to take away. 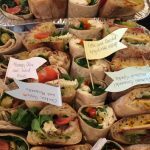 Cherry Leaf also make lunches to order for local businesses and groups.